Bangle's dream will come true. 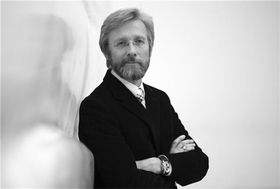 MUNICH - Former BMW design chief Chris Bangle plans to open his own design studio. Bangle left BMW on Feb. 2 "to pursue his own design-related endeavors beyond the auto industry." At a press event here today, Bangle would not comment on his future plans. But Klaus Draeger, BMW's development head, said: "He's going to make his own dream come true. He's going to open his own design studio." Bangle said he could not yet talk about his plans but said he would stay in Germany for a little while. An American, Bangle, 52, spent most of his career in Europe starting at Opel before moving to Fiat. He joined BMW in 1992 and modernized the conservative styling of the premium brand's cars. Bangle's distinctive themes of flame surfacing and pronounced trunk lids aroused strong opposition from many in the industry but the styling was a commercial success.